Astronomers using the National Science Foundation's newly commissioned Robert C. Byrd Green Bank Telescope (GBT) have discovered a windfall of three previously undetected millisecond pulsars in a dense cluster of stars in the Milky Way Galaxy. "This globular cluster, known as Messier 62, has been very well studied, and it would have been an exciting discovery to find just one new pulsar. The fact that we were able to detect three new pulsars at one time is simply remarkable," said Bryan Jacoby, a graduate student at the California Institute of Technology who led the research team. Results of the discovery were recently announced in an International Astronomical Union Circular. Jacoby and his colleague Adam Chandler, also a graduate student at Caltech, used the GBT to search for new pulsars in addition to the three already known in this cluster. Their research was part of the GBT's Early Science Program, which allows scientific investigations during the testing and commissioning of the telescope. The researchers used the Berkeley-Caltech Pulsar Machine, a new instrument whose development was overseen by Donald Backer at the University of California at Berkeley, to process the signals from the GBT and record them for later analysis. After their data were analyzed, the researchers discovered the telltale signatures of three additional pulsars and their white dwarf companion stars. Pulsars are rapidly rotating neutron stars that emit intense beams of radio waves along their misaligned magnetic axes. When these beams intersect the Earth, we see the pulsar flash on and off. Due to their exquisitely steady rotation, pulsars allow astronomers to study the basic laws of physics and the ways in which these dense clusters and exotic stellar systems are formed. Astronomers study globular clusters because they are among the oldest building blocks of our Galaxy. With their very dense stellar populations, these clusters are breeding grounds for unusual binary star systems, like the ones detected by the researchers. All three pulsars are known as "millisecond pulsars" because they make one complete rotation in only a few thousandths of a second. One of these newly discovered pulsars spins at approximately 440 rotations per second, and the other two both spin about 300 times per second. All are orbited by white dwarfs with orbital periods ranging from 4 to 27 hours. 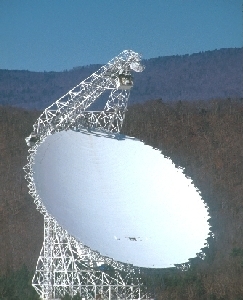 "This discovery demonstrates the remarkable sensitivity of the Green Bank Telescope," said Phil Jewell, site director for the National Radio Astronomy Observatory in Green Bank, W.Va. "The fact that these pulsars were never before detected in this highly studied area of the Galaxy shows that the GBT has outstanding capabilities and will be an important tool for astronomers to make very precise, very sensitive observations of the Universe. The GBT is the world's largest fully steerable radio telescope. It was dedicated on August 25, 2000, after nearly 10 years of construction. Since that time, engineers and scientists at the NRAO in Green Bank have been testing the telescope and outfitting it with the sensitive receivers and electronics that will make it one of the world's premier astronomical instruments. "As a graduate student," said Jacoby "this discovery was particularly satisfying, and I feel privileged to be part of the history of the Green Bank Telescope." Shrinivas Kulkarni, the Caltech faculty advisor for this project, remarked, "it is very satisfying to see such discoveries being made by young people. GBT is poised to play a significant role in the education of young astronomers."